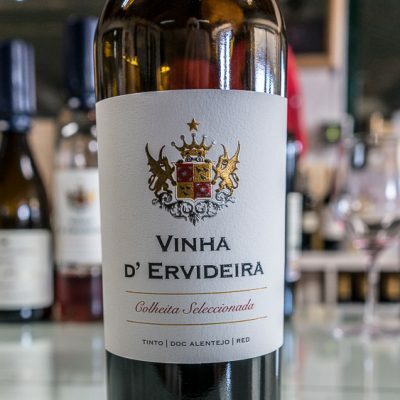 Whilst in Portugal what should a wine lover like me do, go to Porto to do a bit of wine tasting, wrong, that is what everyone does. 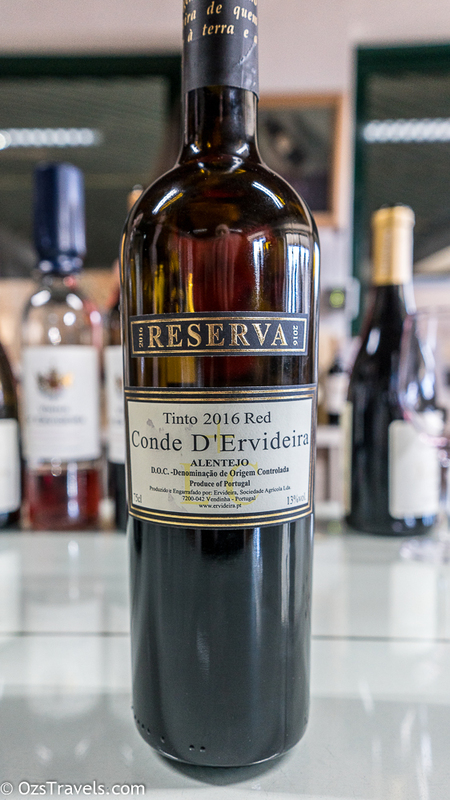 Not really something that I would say is appropriate for me as it is too safe, so I decided to visit the Alentejo D.O.C instead. 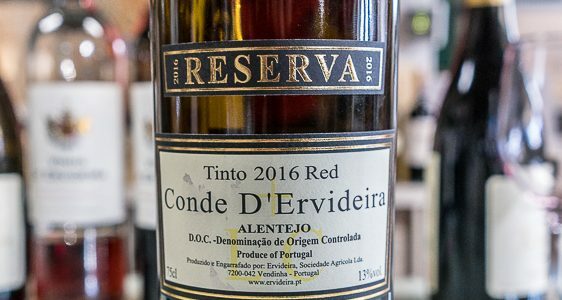 I am reliably informed that all D.O.C’s ( Denominação de Origem Controlada) in Portugal are very good, so I was not risking much. 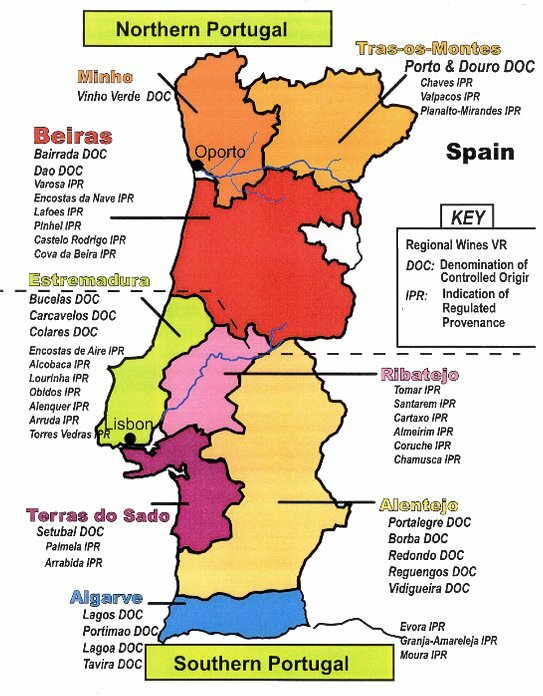 As my Portuguese is as good as my Mandarin and I did not want to taste and drive a wine tour was in order. 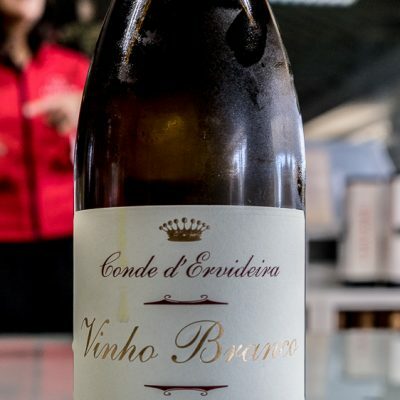 My tour of choice was Cooltour Lisbon‘s Alentejo Wine Tour from Lisbon Including Lunch, the problem was that I was the only one who was booked to go on my tour, luckily for me I was able to convince (well all I had to say was wine) and two friends (who I met for the first time in person after 7 years of remote abuse and banter) Kelly and Tony Summers to join me. 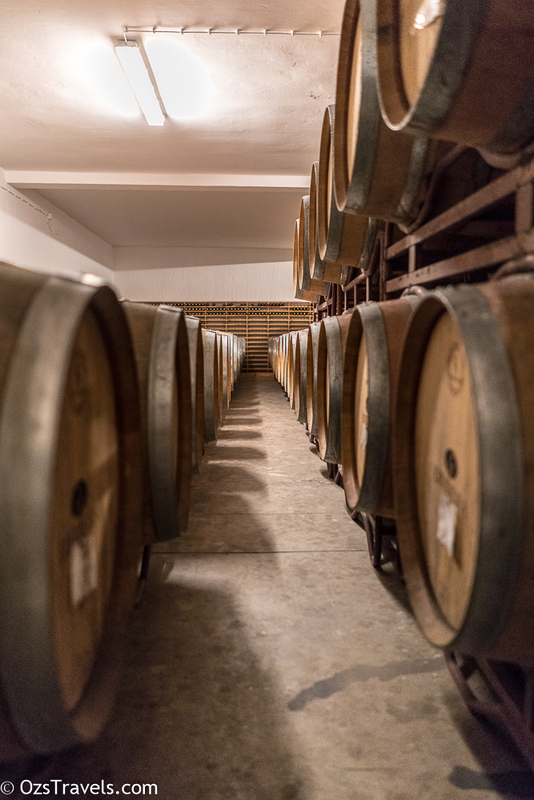 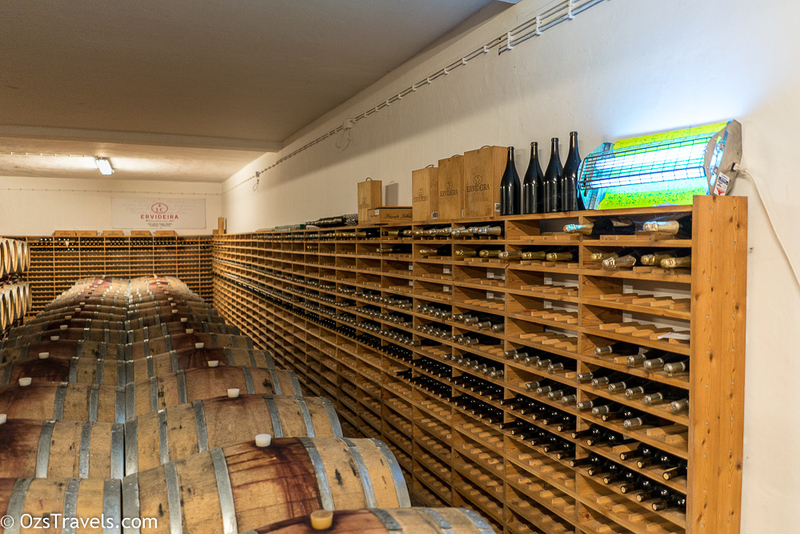 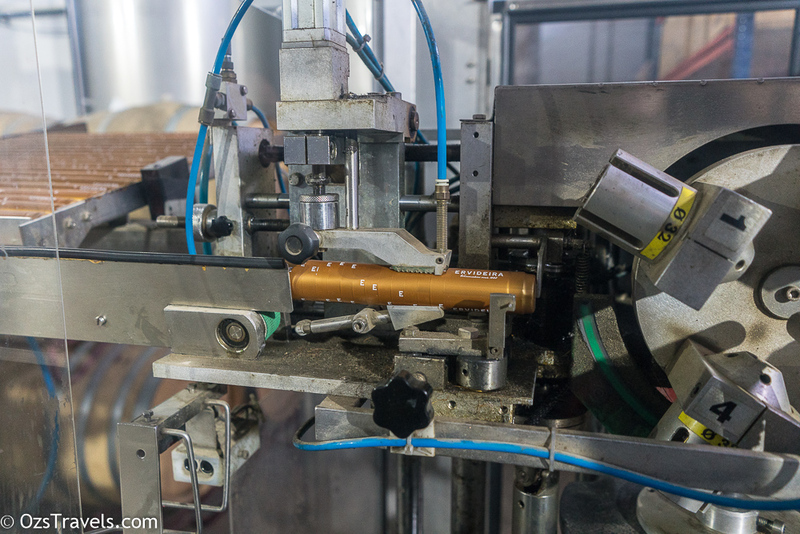 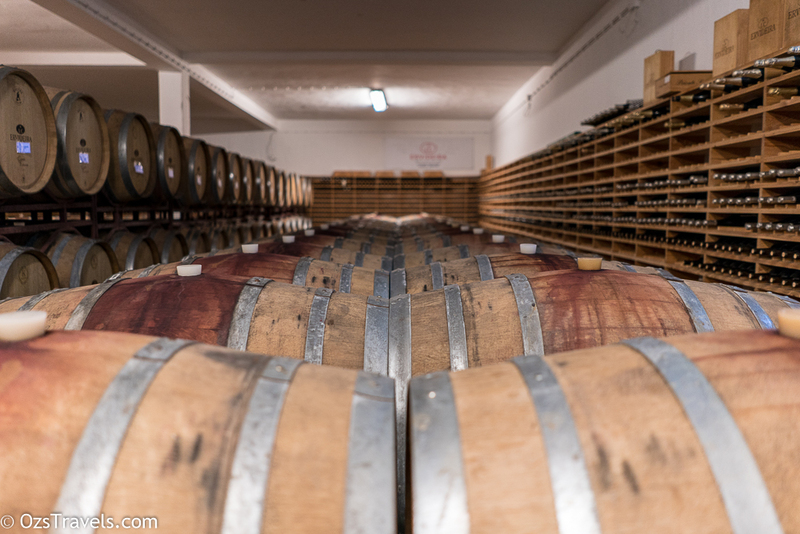 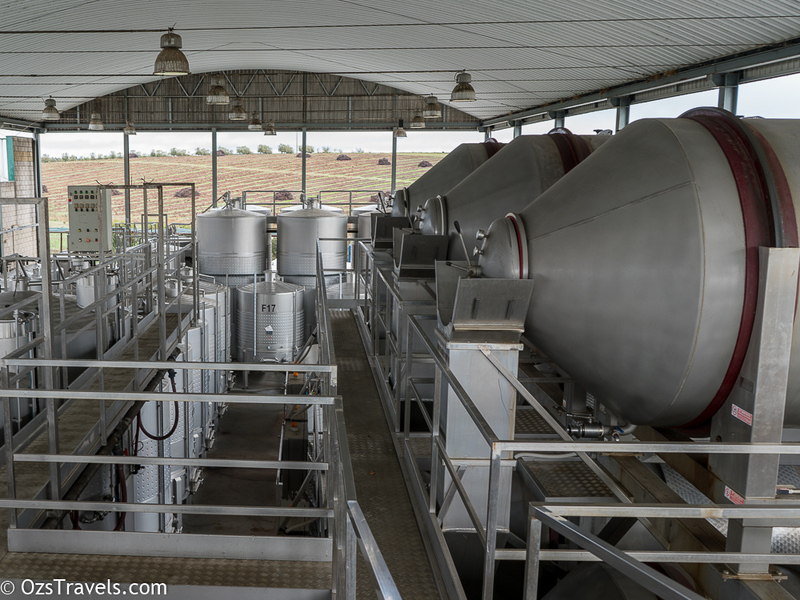 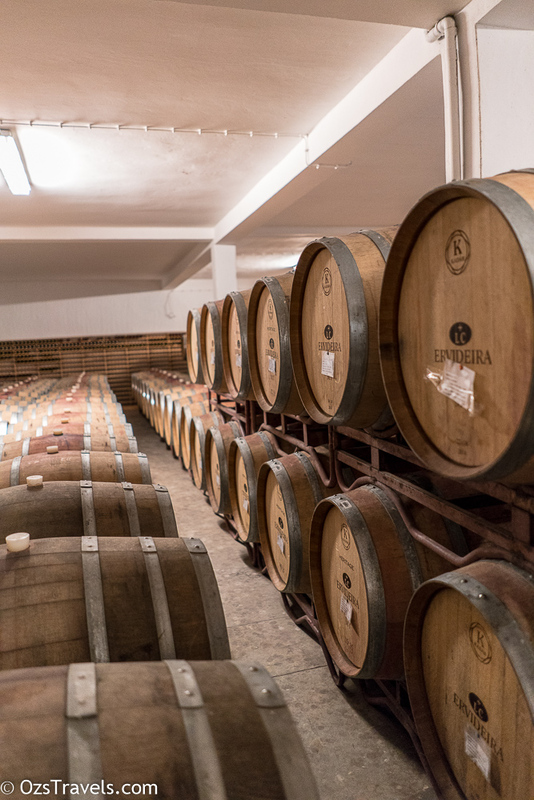 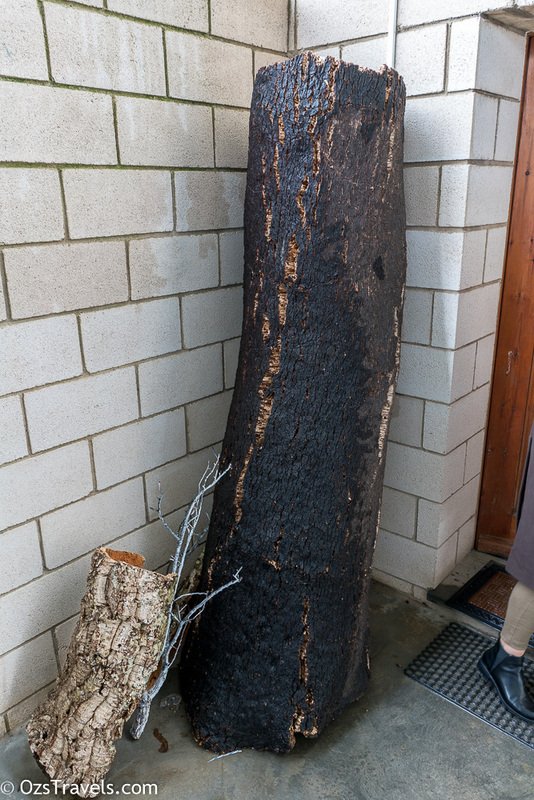 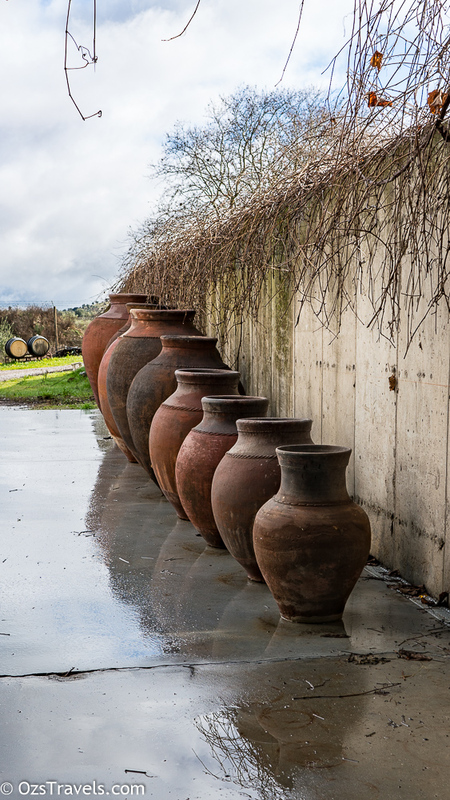 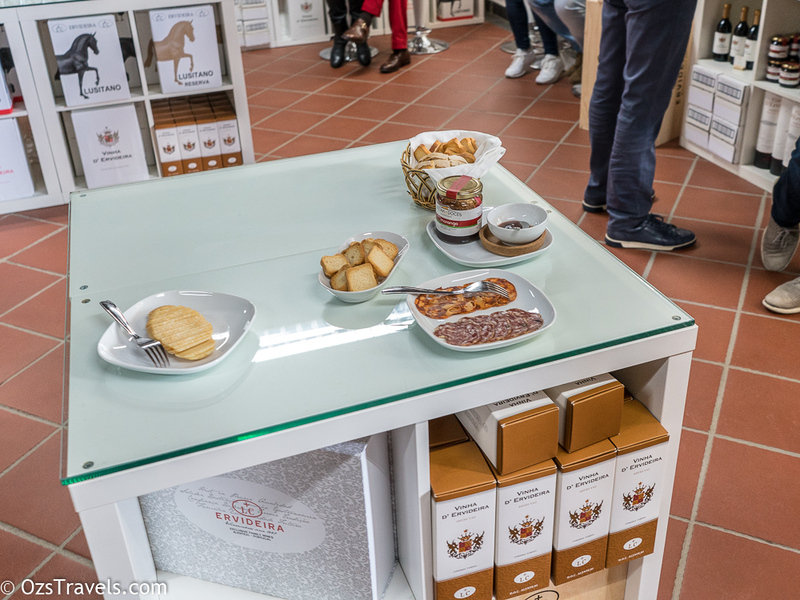 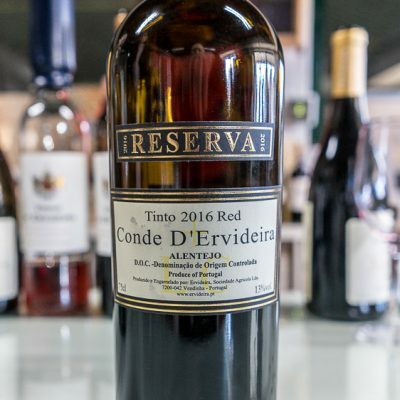 The plan for the day was about a 2 hour drive to the Ervideira Winery in the Alentejo region from Lisbon followed by a winery tour and tasting in the morning, lunch. 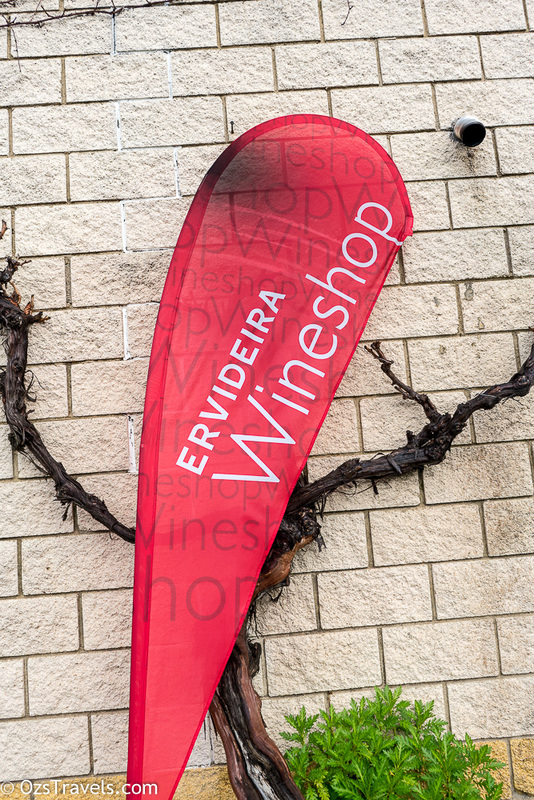 then another winery tour and tasting followed by a 90 minute drive back to Lisbon. 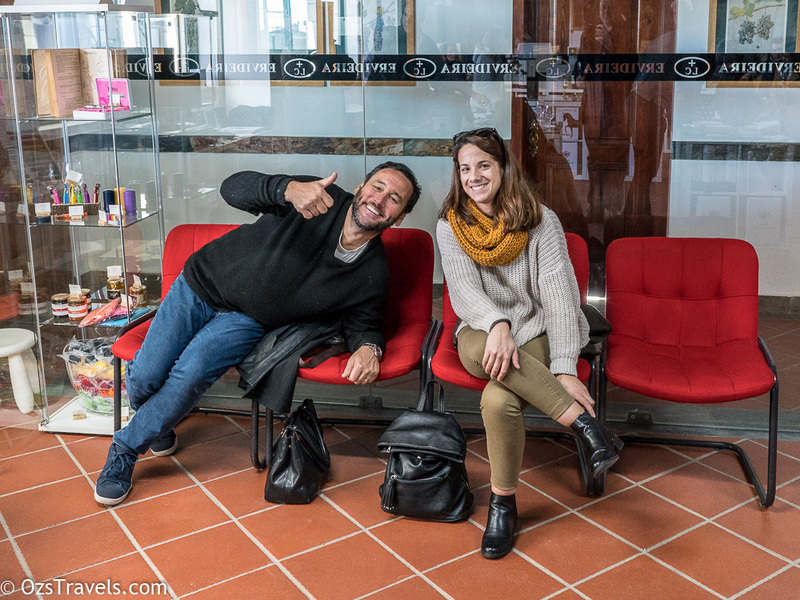 Tony and our great Tour Guide!! 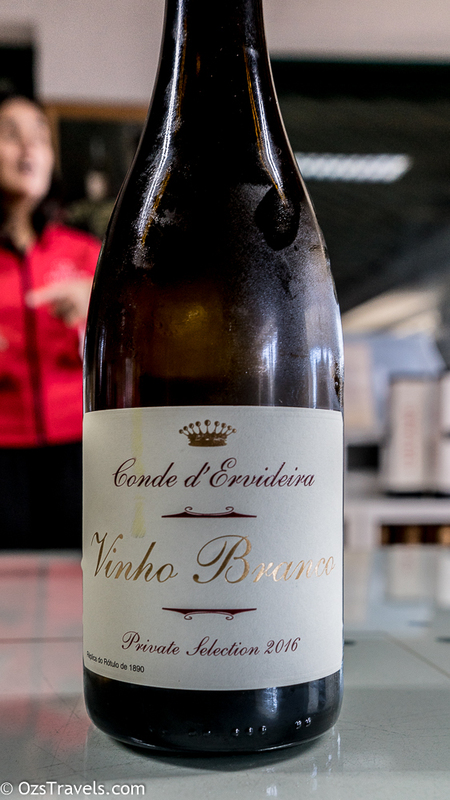 I would recommend Cooltour Lisbon and especially this Tour, good value for money, about the right length of time and the itinerary is spot on. 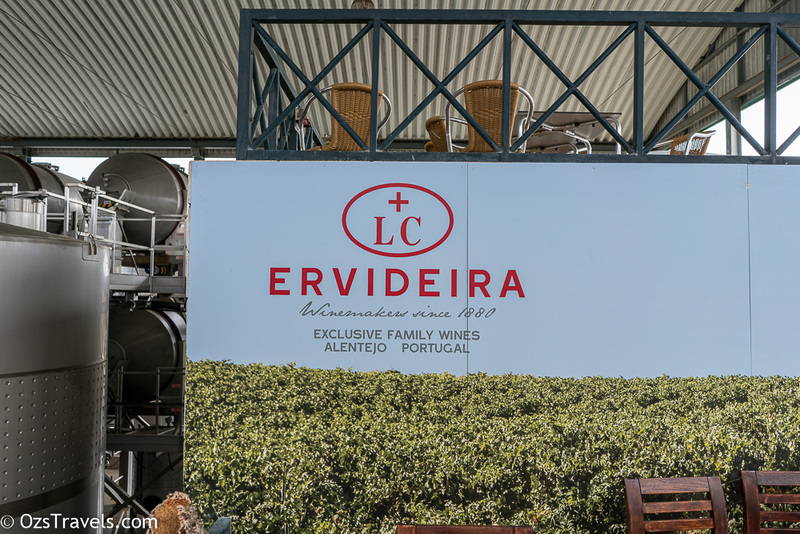 Ervideira Winery was our first stop and a very informative and interesting place to start our Alentejo Portuguese Wine education. 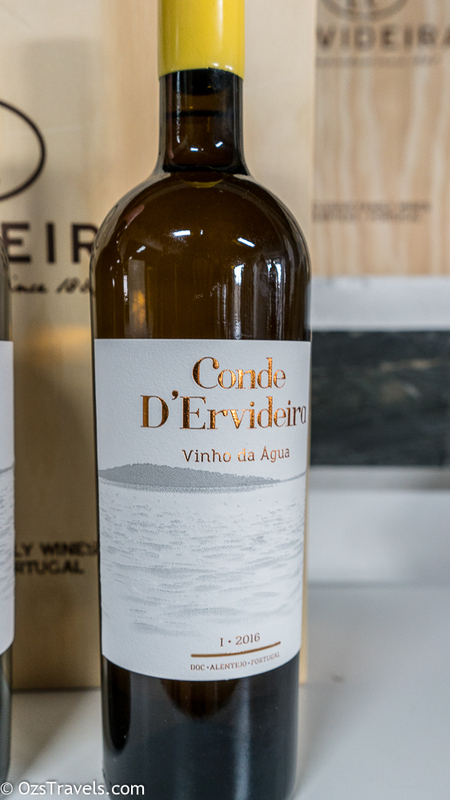 The estates of Herdade da Monte da Ribeira and Herdadeinha belong to the Leal da Costa family, a direct descendant of Count D’Ervideira, a successful farmer from the 16th century. 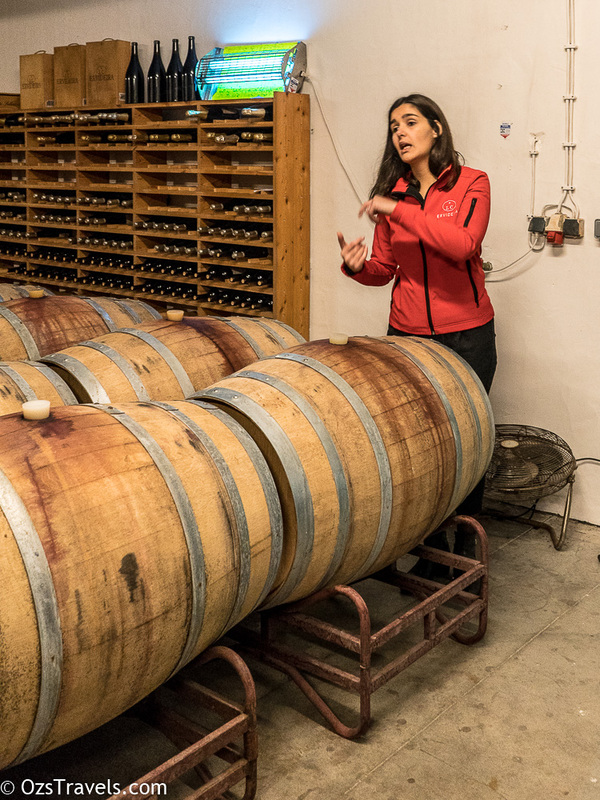 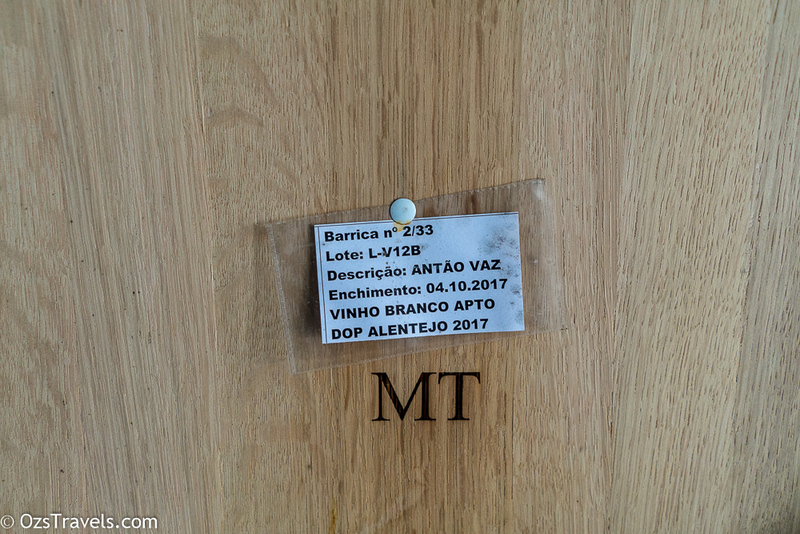 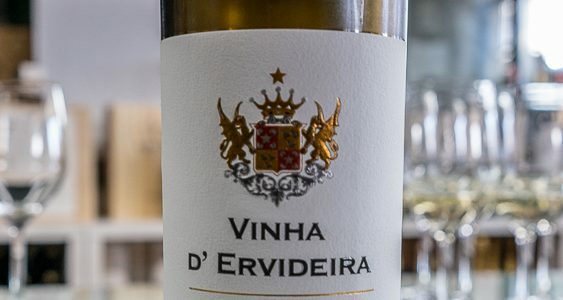 With 160 ha of vineyards divided by Vidigueira (110 ha) and Reguengos de Monsaraz (50 ha), the administration of Ervideira is ensured by Maria Isabel Leal da Costa, the matriarch of the family, and her six children, Duarte Leal da The Executive Director. 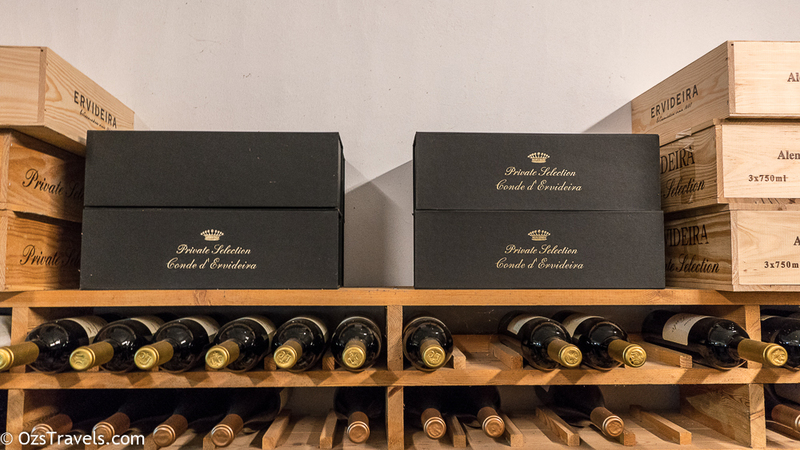 The oenological direction is the responsibility of Nelson Rolo. 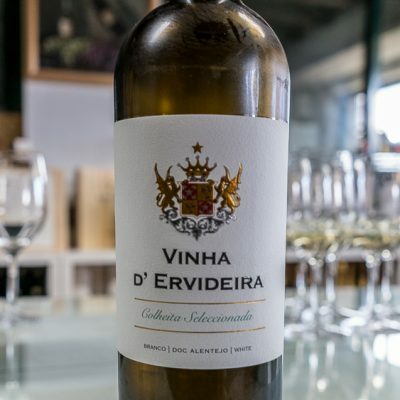 The estates of Monte da Ribeira and Herdadinha both belong to the Leal da Costa family, which can be traced back to the Count of Ervideira, a successful farmer who lived between 19th and 20th centuries. 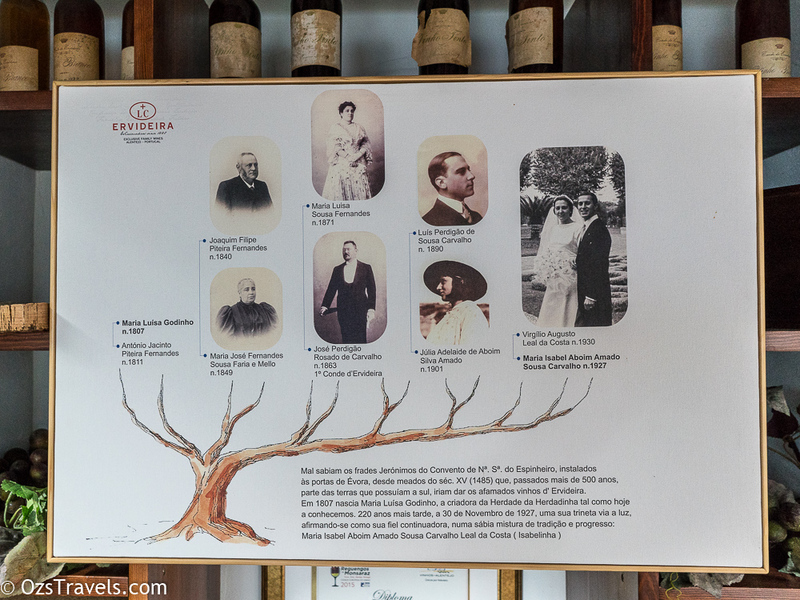 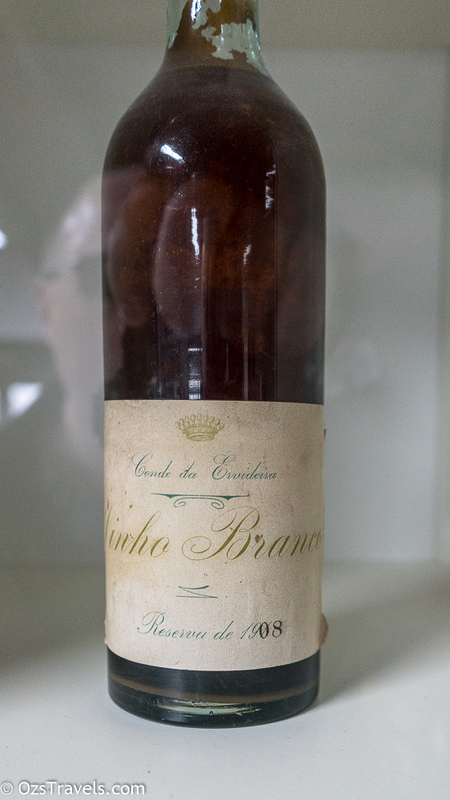 The Count, who received his nobel title from King Carlos 1 in recognition for his social work in the region, began producing wine in 1880, as one can see in the bottles the company proudly exhibits in its wine tasting room. 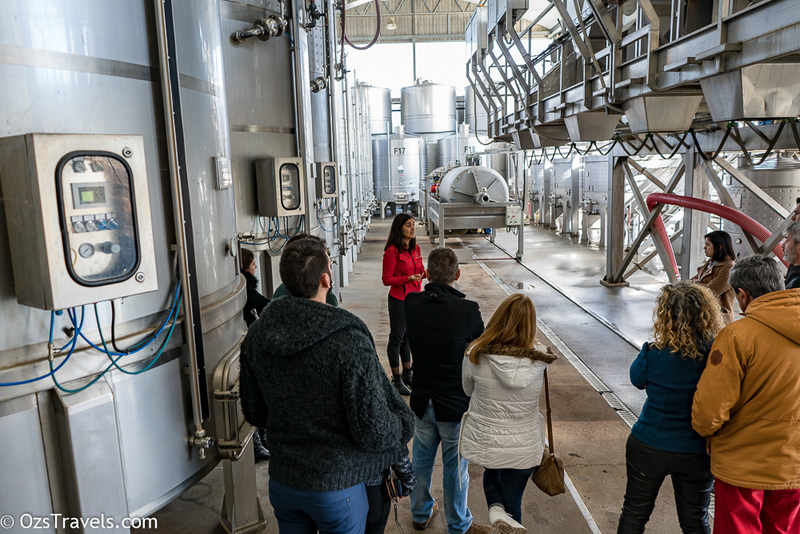 We started our tour with a walk around the winery where we learnt about their history and the process. 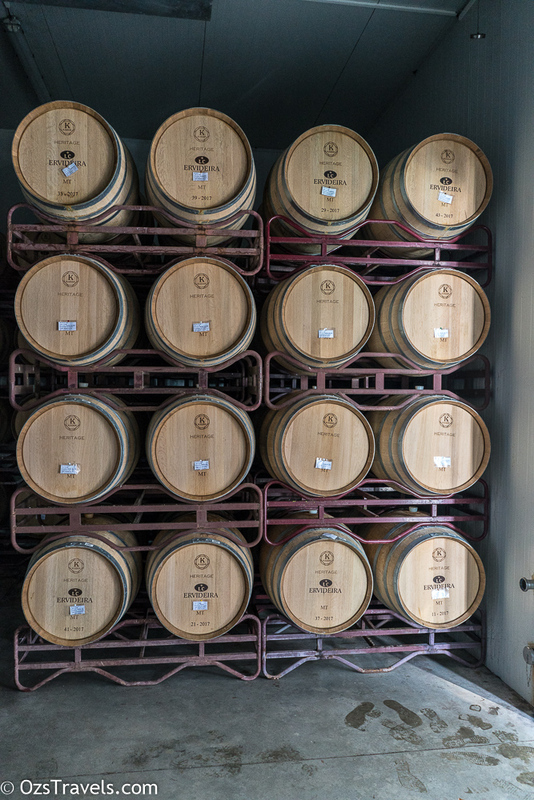 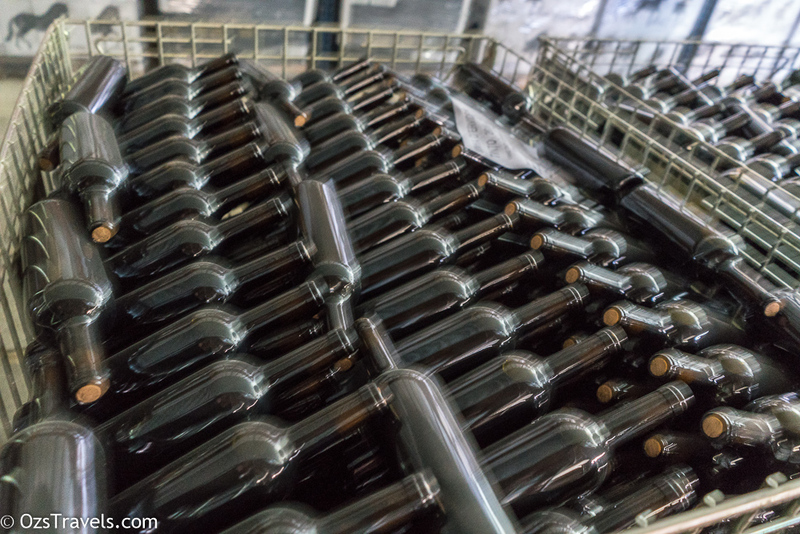 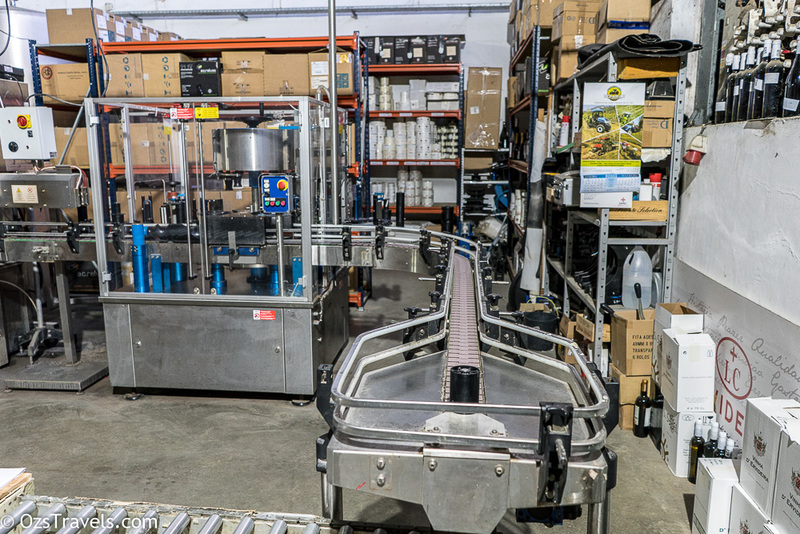 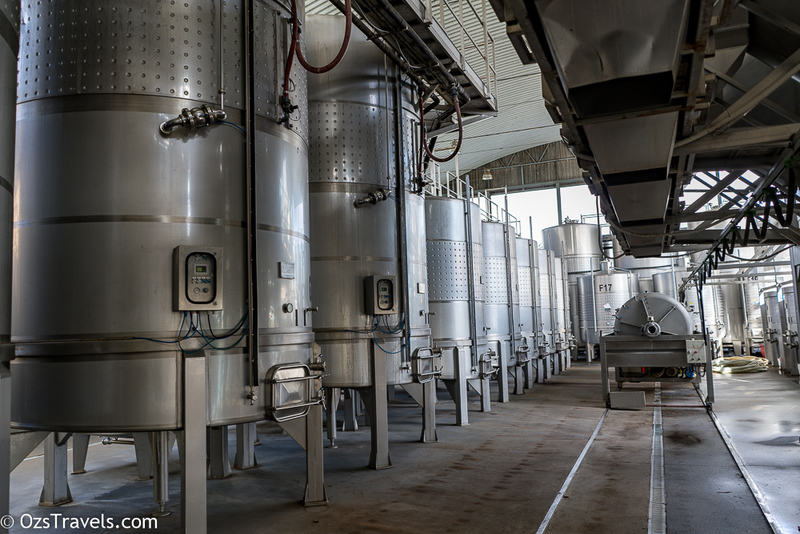 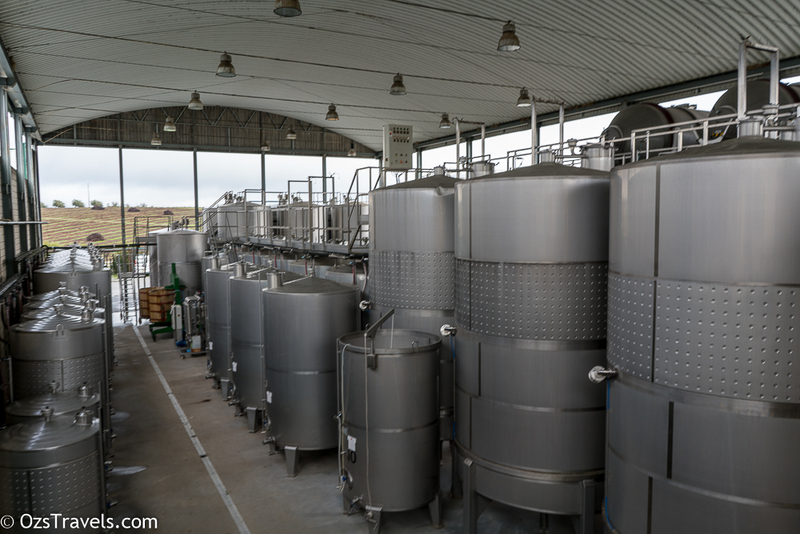 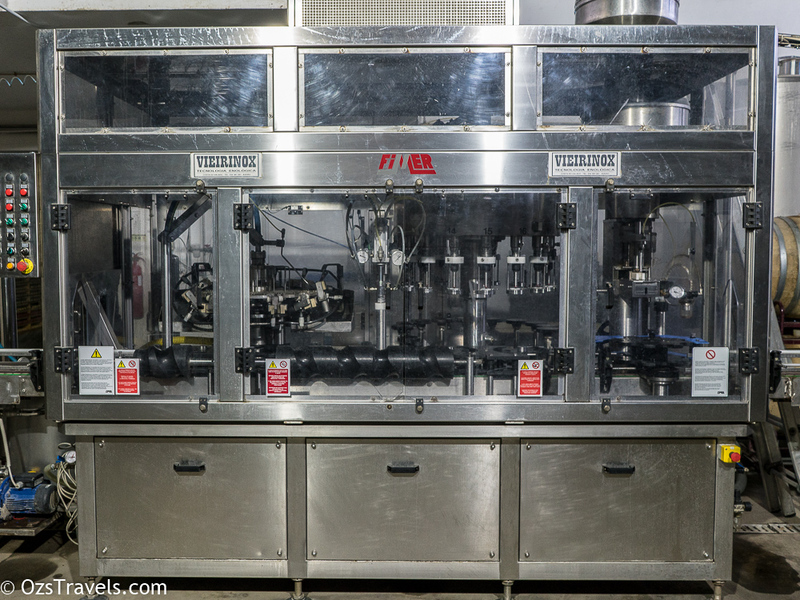 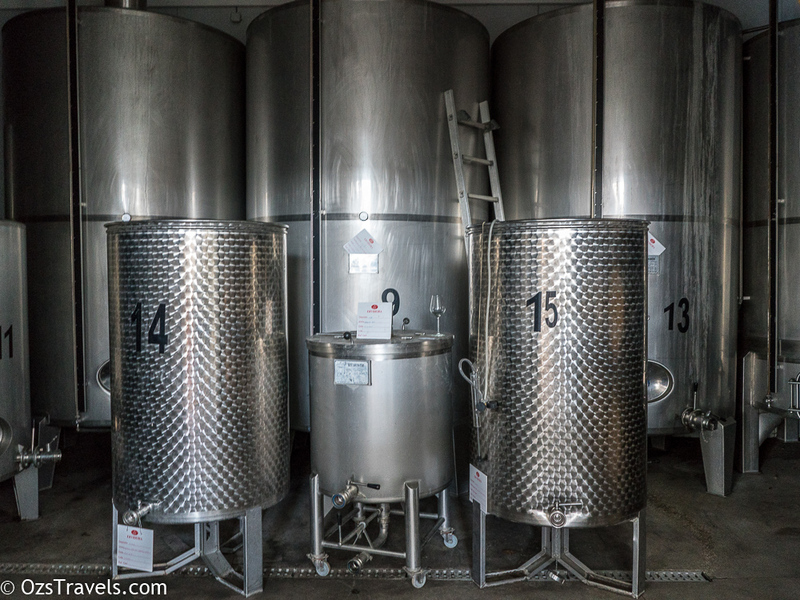 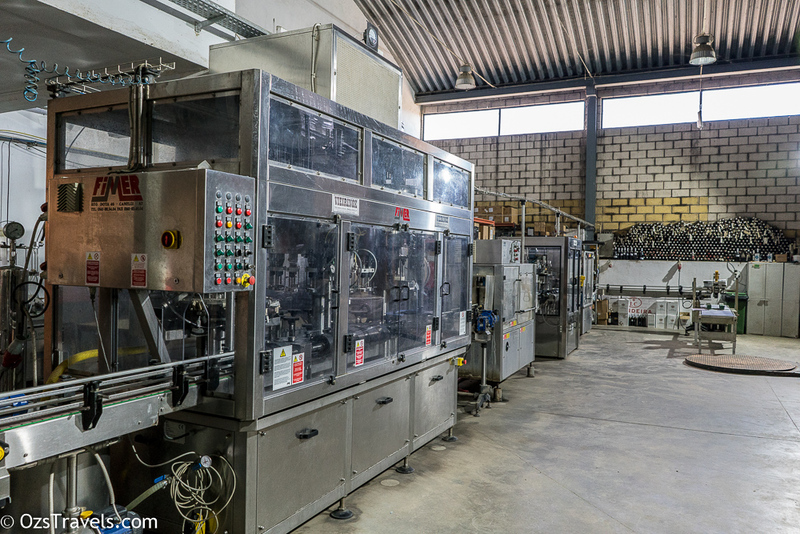 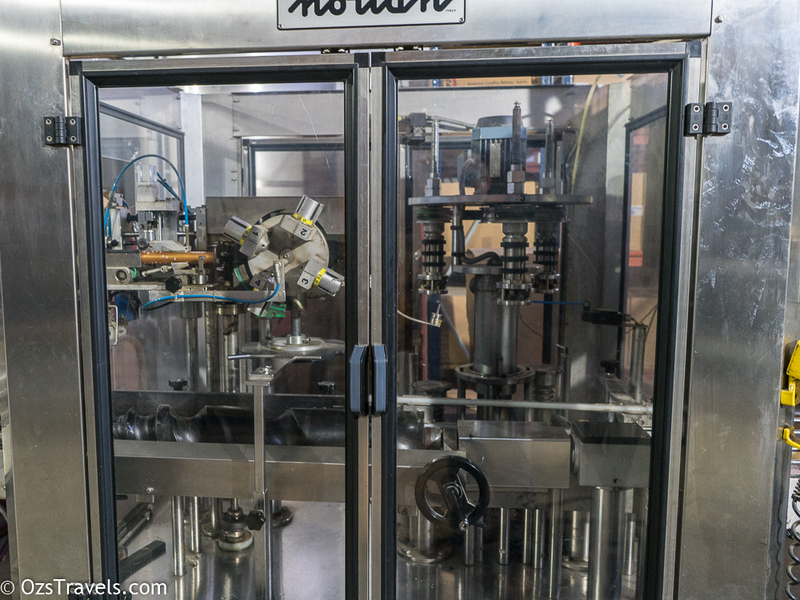 The winery produces 800,000 bottles of per year, but I am not sure if they can bottle that many onsite. 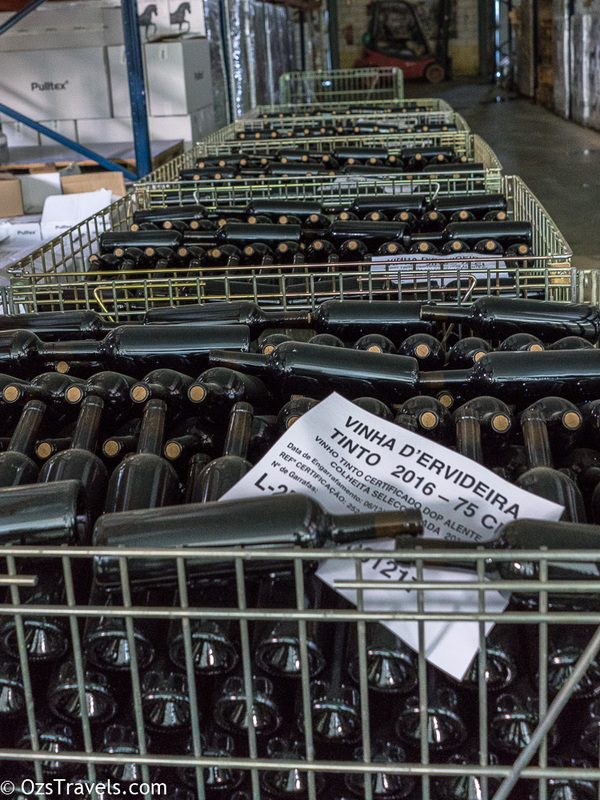 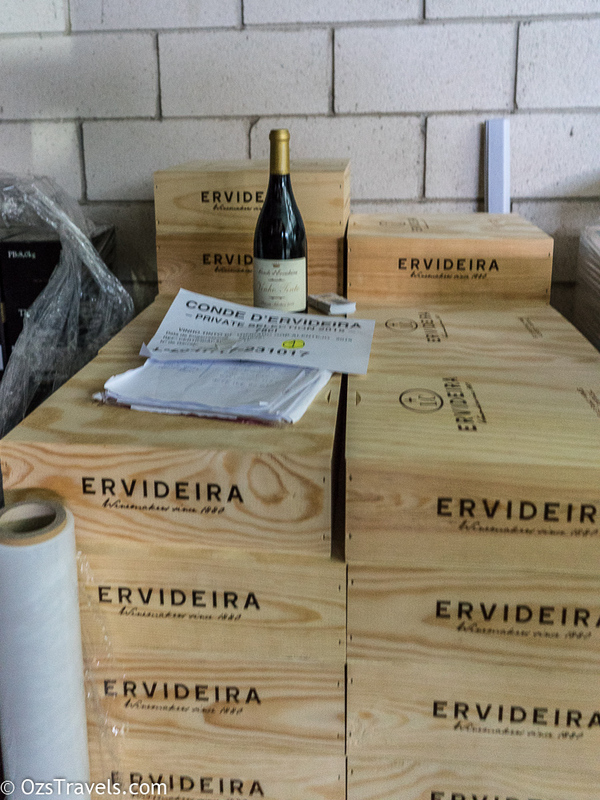 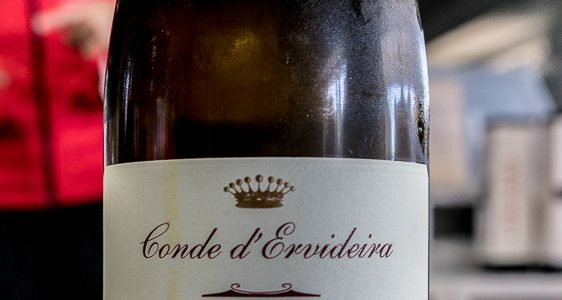 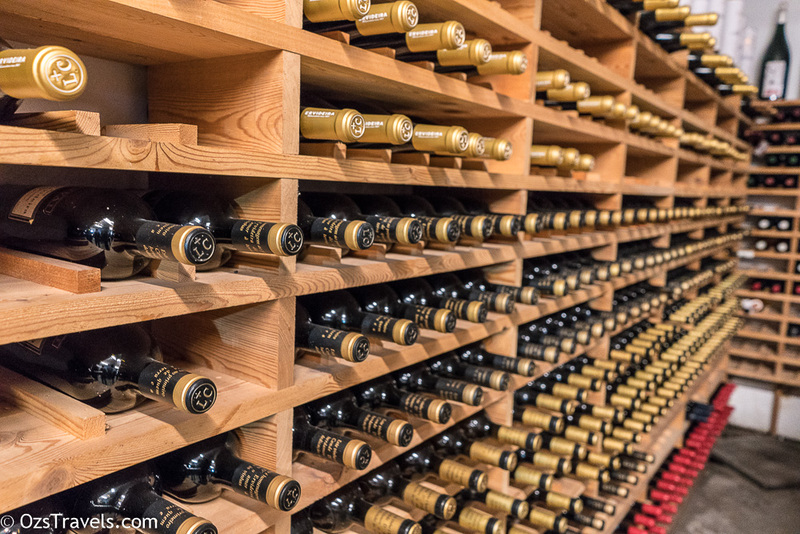 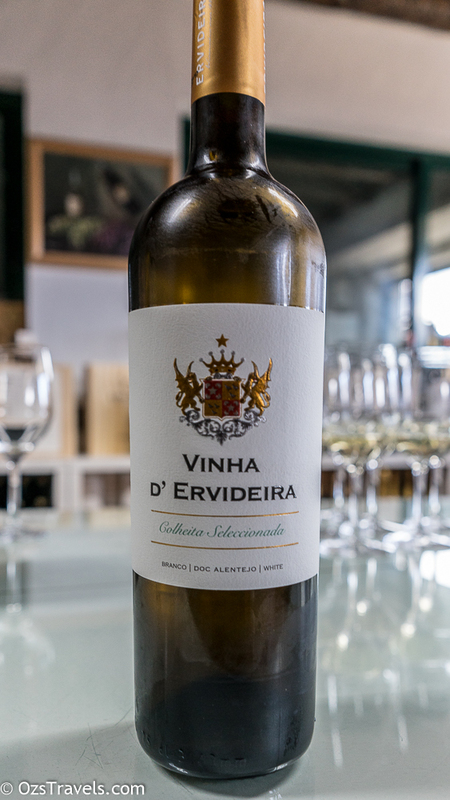 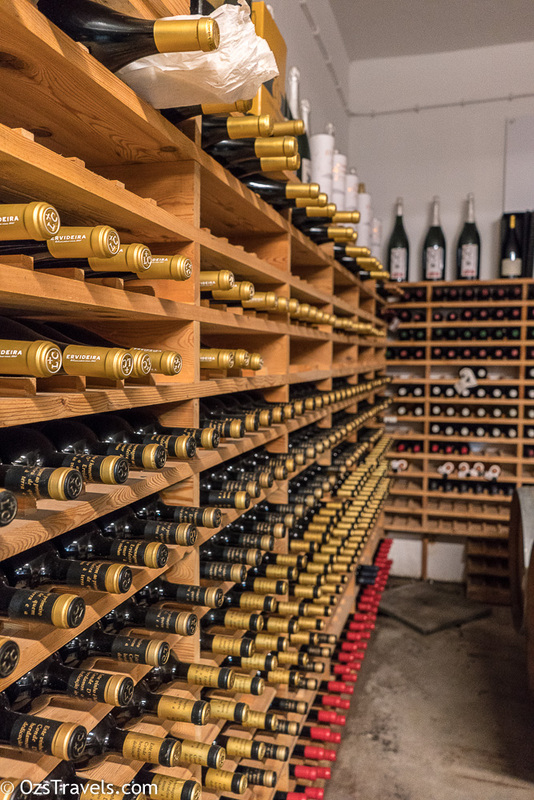 Ervideria Wines export 40% of their wine overseas to Brazil, Canada, United States and Mexico; Germany, Belgium, Slovenia, Spain, France, Netherlands, Luxemburg, United Kingdom, Czech Republic, Sweden and Switzerland; Cabo Verde, Angola and Mozambique; and Macau/ China. 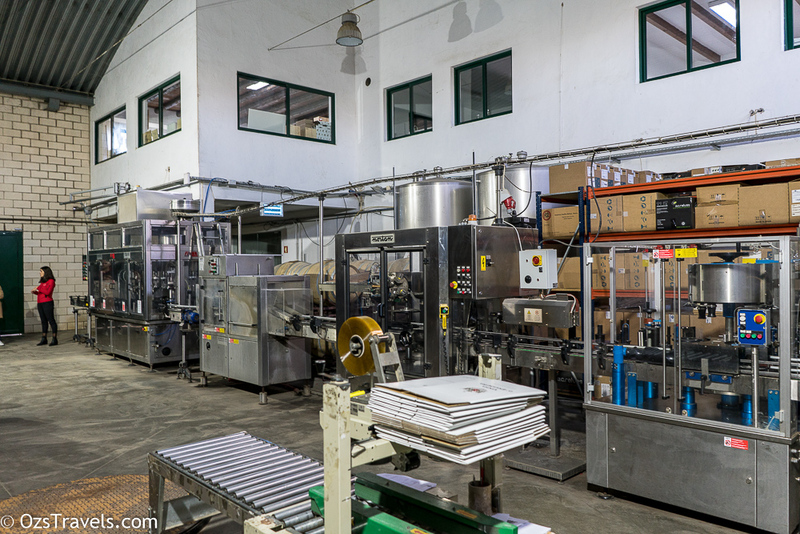 Unfortunately not to Singapore!! 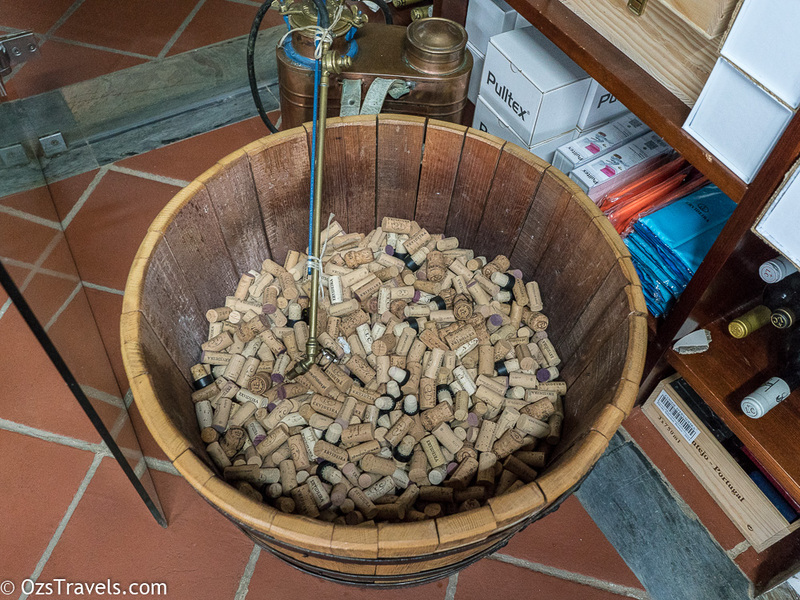 Now for the important stuff, the wine tasting. 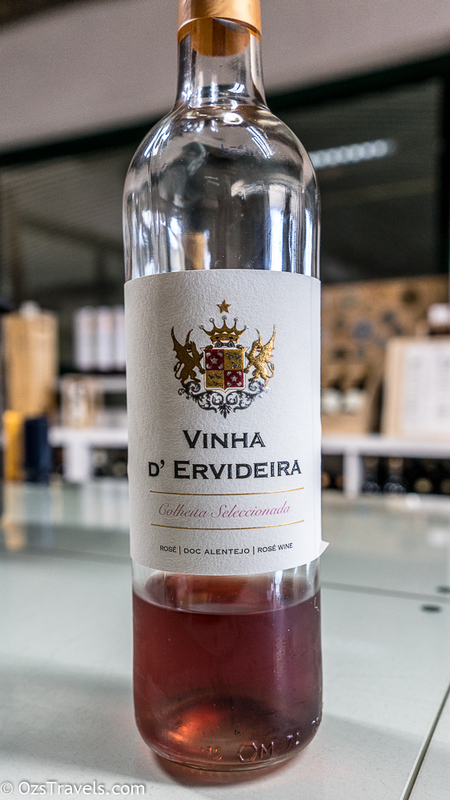 My favourites from our Ervideira Winery tasting were the two Private Selection wines, especially the Branco, I also liked the Rosé. 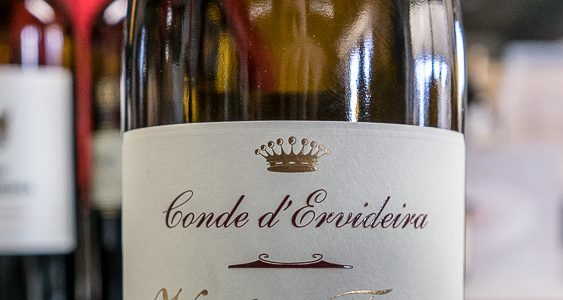 Has a bright light straw hue, on the nose it has a restrained combination of vanilla and green tea aromas. 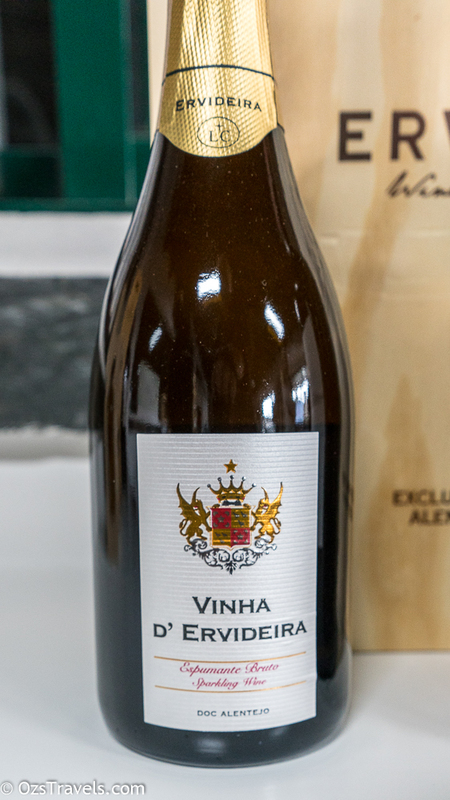 The palate is elegant and euphonious (not sure that there is taste version of this word, but I like it) with an enjoyable medium finish. 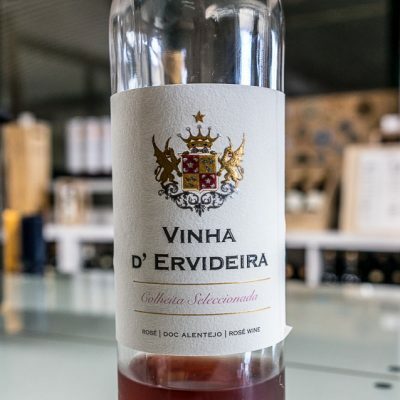 Has a bright light pink hue with a very pleasant combo of apricot and strawberry jam aromas. 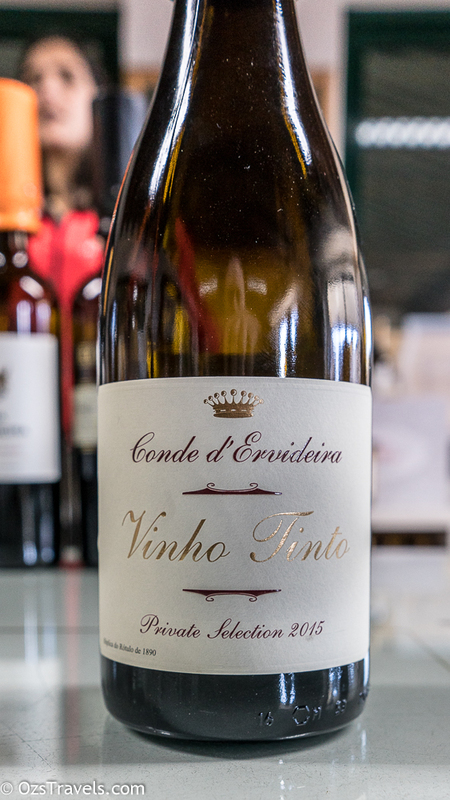 The slightly tart palate is understated with subtle tannins and a hint of sweetness on the medium finish. 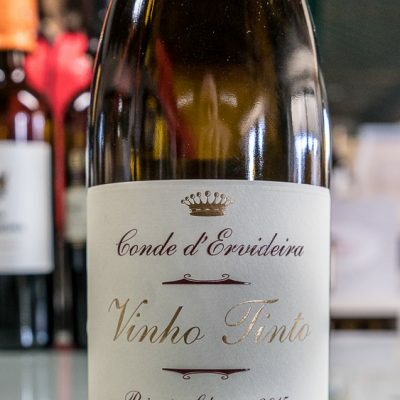 The wine has a bright, youthful garnet colour with a medium-bodied mix of prune, vanilla and white pepper aromas. 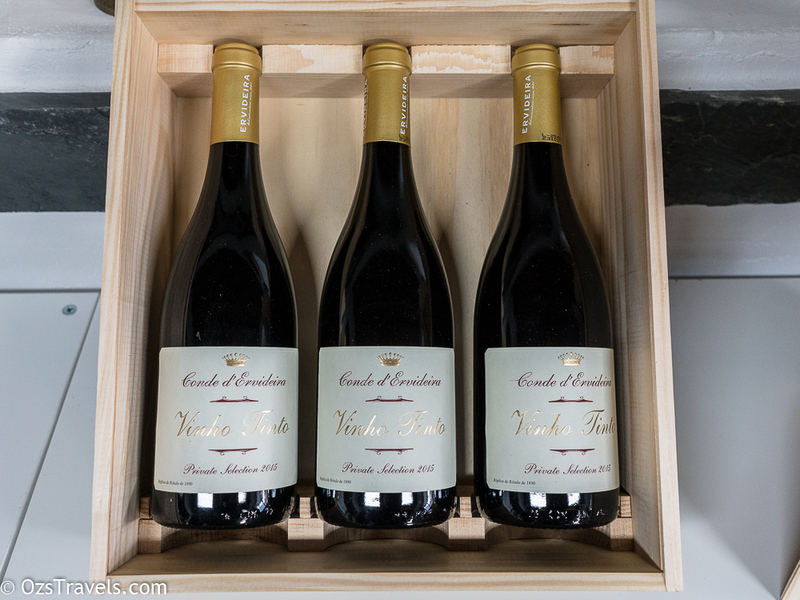 The palate is also medium-bodied and a bit tart with firm, savoury tannins and a medium finish. 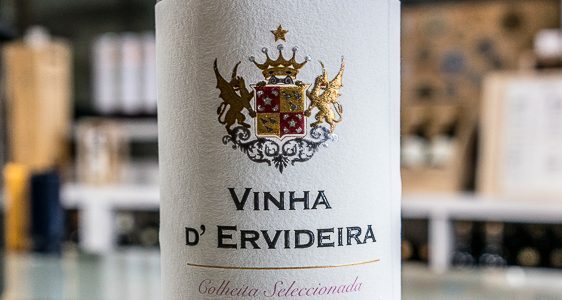 Has a vivid medium deep crimson hue with a restrained nose of dark fruit, vanilla and white pepper aromas. 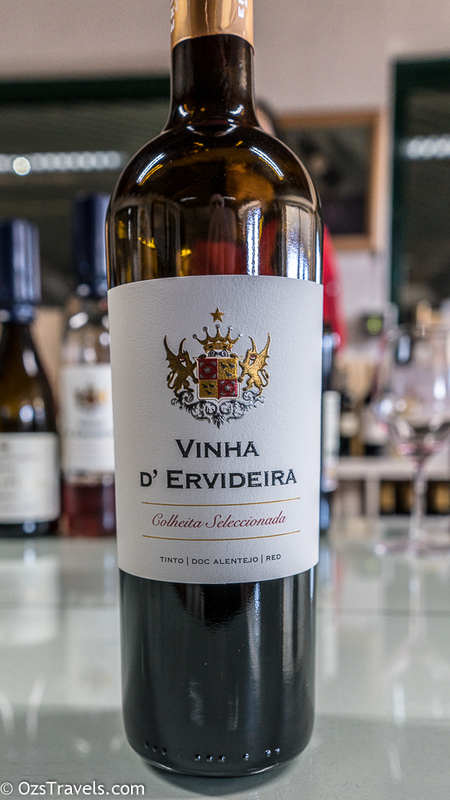 The palate is subtle and a bit tart with evolving, firm tannins and a medium-long finish. 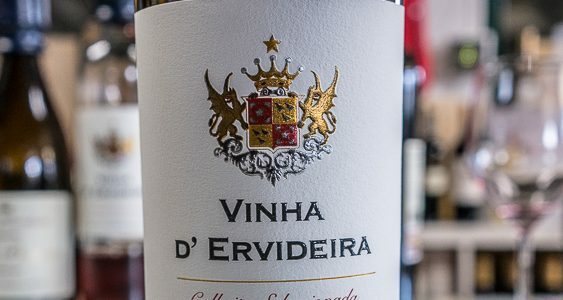 This wine has a youthful, medium deep crimson appearance with an enjoyable medium-bodied nose with a combo of mocha and spice aromas. 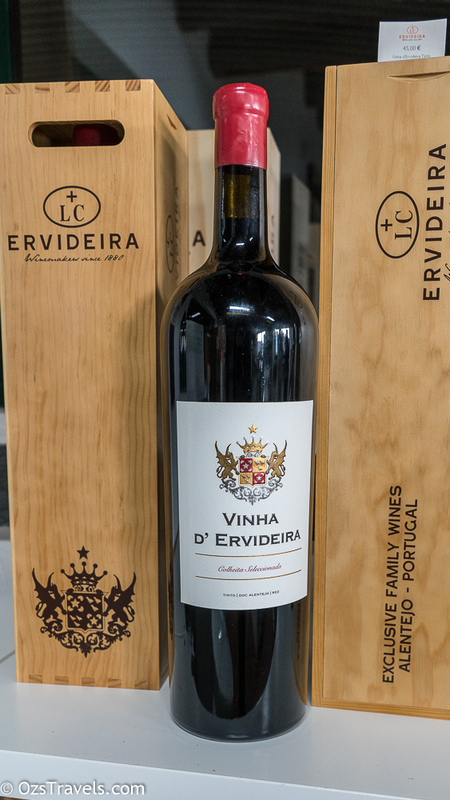 Its medium-bodied palate is a bit imature with lithe, evolving tannins and a medium-long finish. 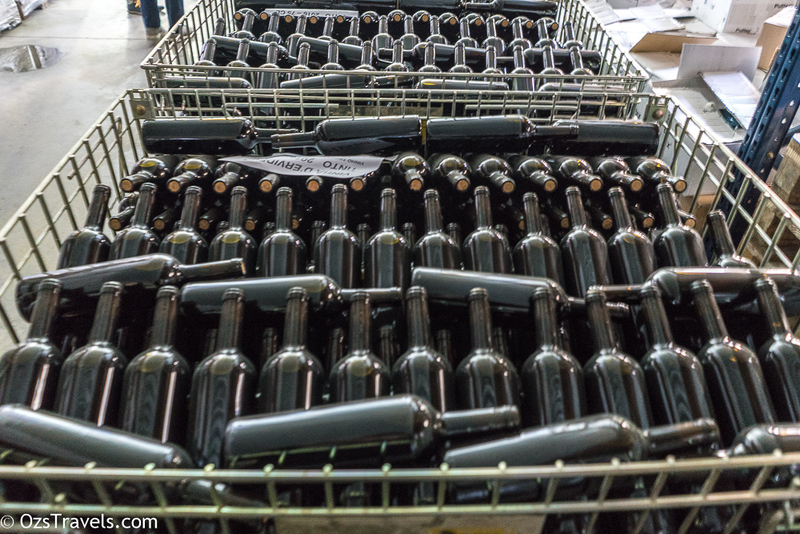 This has all the elements of becoming a good, maybe even a great, wine with a bit of patience. 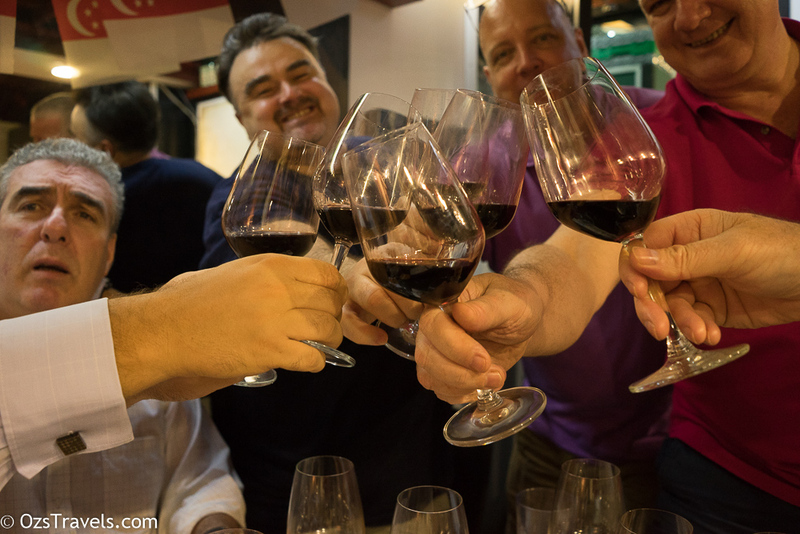 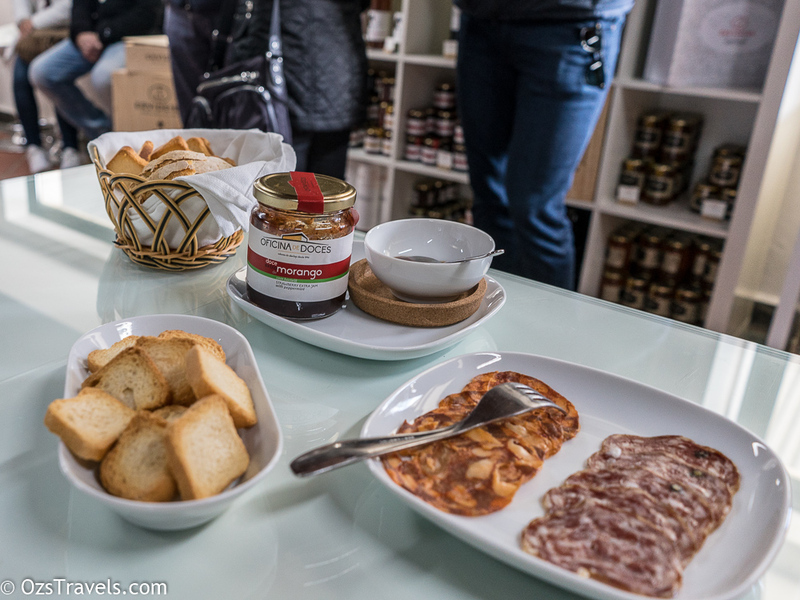 I really enjoyed the Wine Tasting, the addition of local cheeses and cured meats added to it. 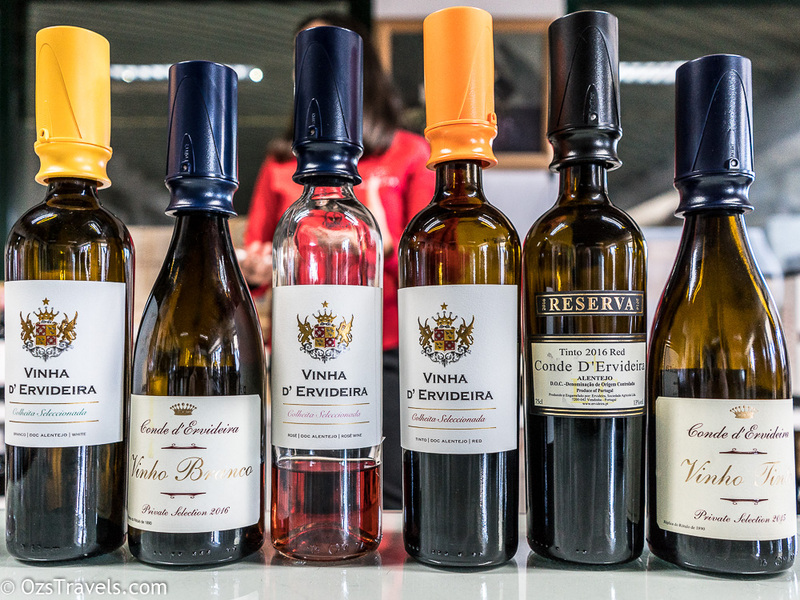 A good selection of wines try from three different quality points, the Private Selection wines are the ones to look for, the Tinto with a few years of age will only get better. 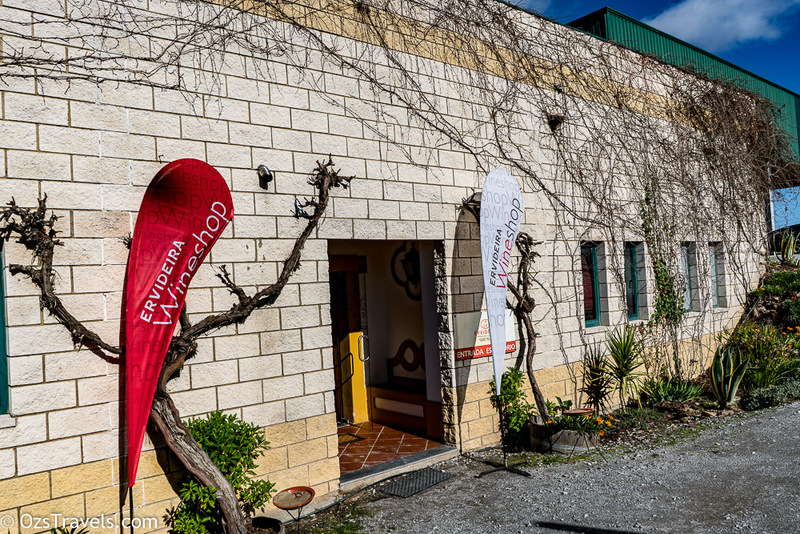 The tour of the facility was pretty interesting, but I think we would have learnt more if we could speak Portuguese. 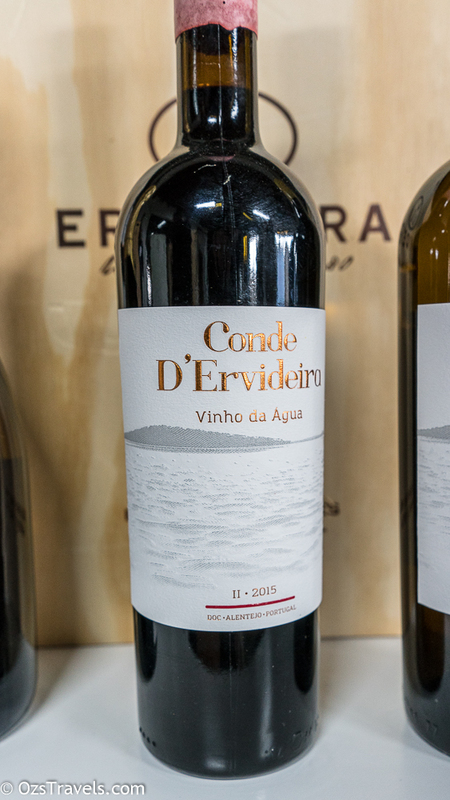 The commentary provided in Portuguese took longer, so guessing a bit more information was being provided, but if we were in another country the local language version would more than likely be more detailed as well. 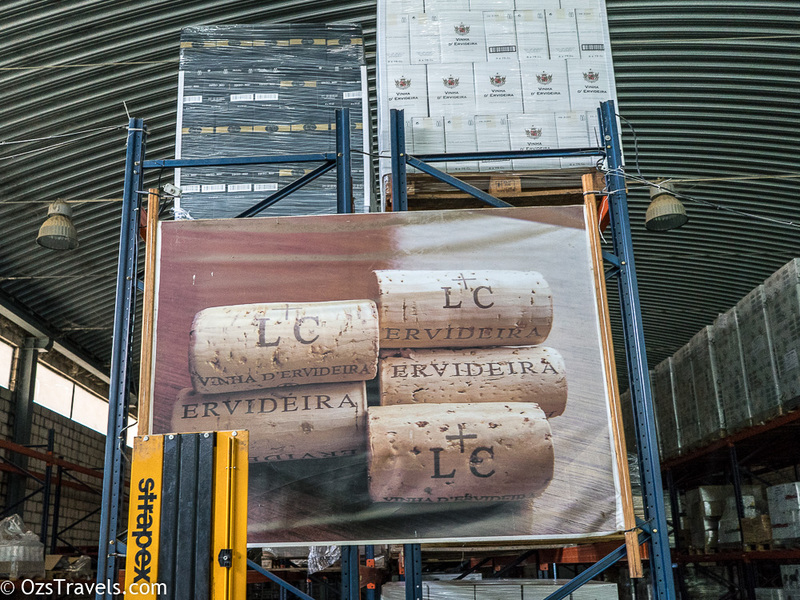 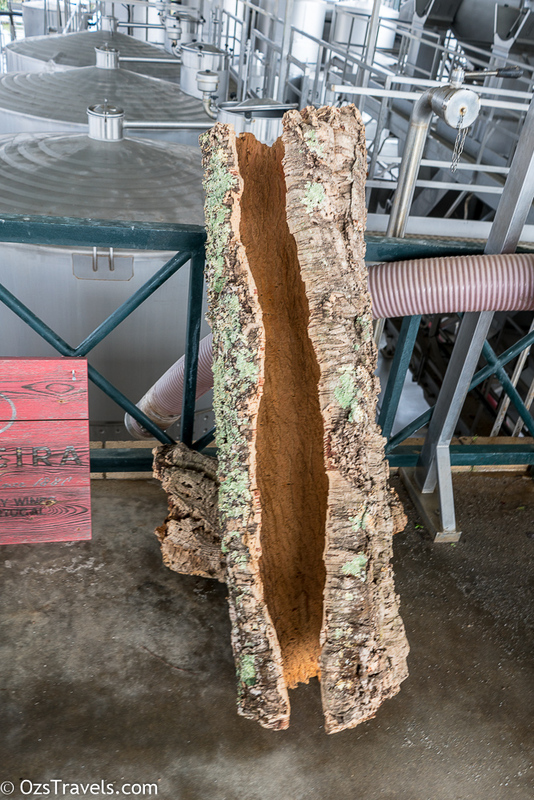 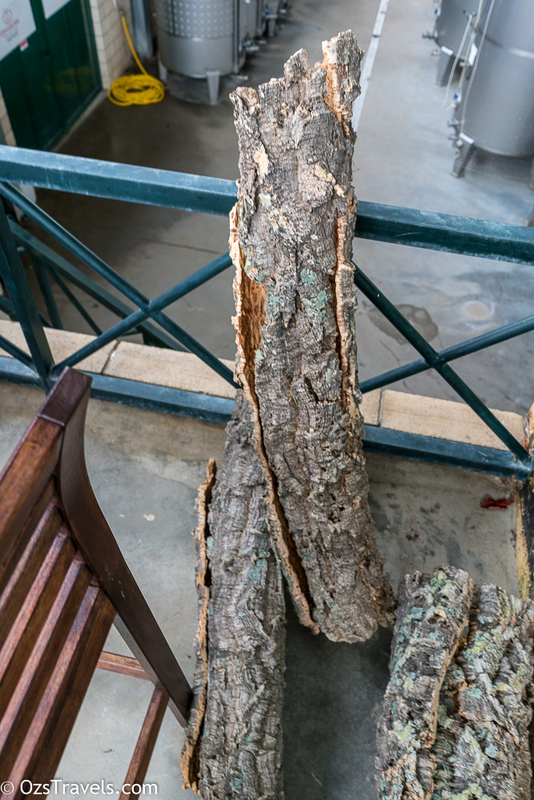 If you are in the region I would recommend a visit to the Ervideira Winery and also taking the tour.